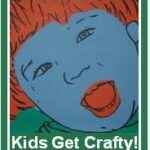 Welcome to Kids Get Crafty! A couple of weeks ago we went to see a “special under threes” theatre production of Oliver Jeffers Lost & Found. It was wonderful and Red Ted loved it. He kept glancing round to me and giving me the biggest smiles and grins. Then turning back to the 30min play giggling away. Afterwards we went for juice and a biscuit. On the way home, we waddled like the penguin and wooshed liked the see. What a lovely afternoon. I wanted to capture it for him, so we decided to Get Crafty!!! 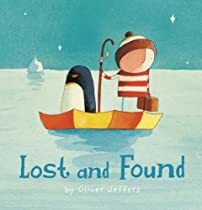 Lost and Found, by Oliver Jeffers. 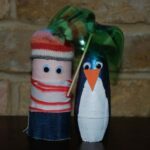 Well… a few months ago, when I first bought the theatre tickets, we got crafty and made some penguins… so go and hop over for the book review there! For the umbrella: cut off the bottom of a plastic bottle – secure stick with bluetack. Done! We then had a theartre production. And then we made a house for The Boy and The Penguin to sleep in too. We love cardboard boxes!! 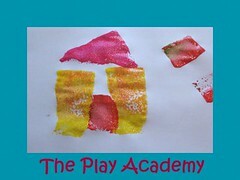 If you enjoy blog hops and link up parties.. do go and the fabulous Play Academy & Something for the Weekend every Friday and Monkeys Doodles every Monday! Just click on the badges below! Adorable! I love that red ted is wearing a shirt just like the boy in the book! His craft is so cute! I love that he can act out his own production. And the umbrella is great! 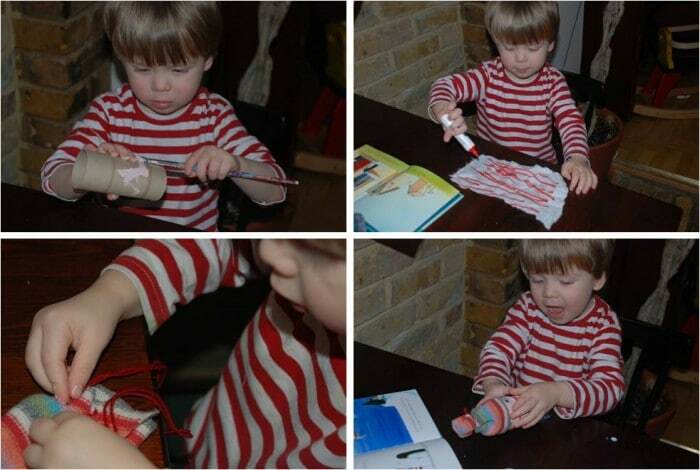 Oh yes, it was a funny coincidence that he was wearing the stripy shirt. It made him very happy! And he LOVED sewing. Need to have another go! Thanks for the invite. 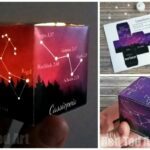 I love all of the fabulous ideas here! Very very cute! 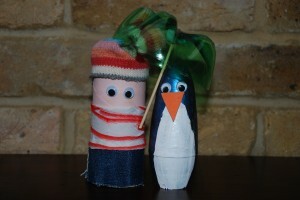 What did you make the penquin out of? Thanks again for inviting me last week! This obviously means you need the “right brand”, so if you can’t find that shape (they are v common in the UK), you could make a loo roll one, I know it wouldn’t be as “perfect”, but still cute? I love that you cute creatures became performers and put on a show. 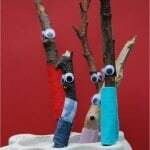 I love this craft… will definitely try and do something similar with Milo – he’s obsessed with Oliver Jeffers at the moment! We love the book, and the characters to go with it are super cute. I have to see if maybe we have this play somewhere in our area too. That is too cute!! Love the theme and I love their little theater! Love, Love, Love the penguin! Thank you for sharing. I LOVE that you made the little guy to go with the story! We love this book over at our house too, and the characters that you made are perfect! Your son’s striped shirt is so adorable! My deodorant containers aren’t shaped like that but I’ve seen mini shampoo bottles with that shape. Both the boy and penguin turned out great. You always have the best crafts! This looks like a great book too. LOVE your theatre production:-). I love, love, LOVE the penguin. Sweet post. Your “Lost & Found” characters are precious. Absolutely adorable, I love projects that reinact characters from stories. You have reminded me to do more of these. Oh, we love Lost and Found! 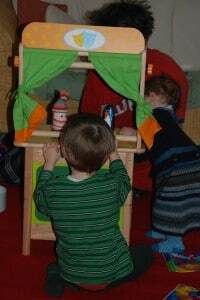 We made a pupet theatre last week too, so we will definitely have to have a go at bringing the book to life. Great idea! Wow! How amazing! My four year old loves Lost and Found and made us watch the TV adaptation over and over and over! Thanks for the invite Maggy! The penguin is very cute! 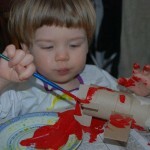 we are planning to do one with recycled juice containers. I started following your blog recently through RSS feed. You have very adorable ideas! Esther – thank you so much for that very kind comment! Glad you enjoy the blog!!! And using juice containers sounds like a great idea! Have not read this book. Love the craft! Pleasure, the Resource Centre is a great, uhm, Resource!!!! That’s fantastic – great to see what a visit to the theatre can inspire! The penguin is sooo adorable. 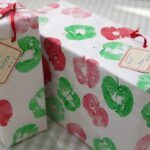 Love this idea and your kids looked like they had a fantastic time! There is something about penguins I just love. I have found some of the cutest books with them. 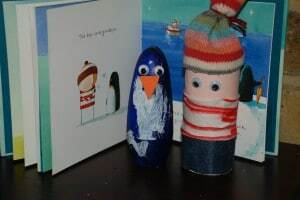 I love the cute things you made to go with the book; especially the house to play with the penguin in! 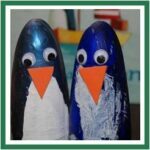 Great project, and just love that deodorant bottle Penguin! 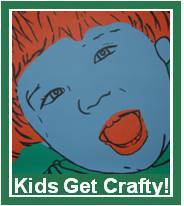 Thanks so very much for dropping by Craft Schooling Sunday and contributing, I really appreciate it! all the best! Cute ideas! 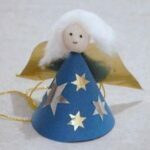 We are exploring The Snowy Day all week this week, begining with sensorimotor, but alter with crafts, too. So very sweet. Thanks for linking to We Play again this week, it would be lovely if you could include it as a link in your post. Thanks for showing me your cool recycled puppets. 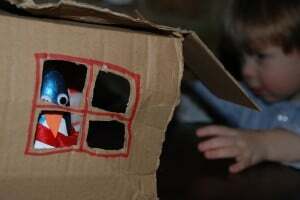 Something about the penguin peeping out of the house made me laugh! Very sweet. The recipe’s sound great – gonna get the aprons out in the next few days and give them a whirl! Pleasure, hope you like the recipes! We always have frozen berries in the house now and it is def a rainy day activity for us. You can use choc chips too! And the short bread is easy and taste and very cut out able! Thanks as always for linking up at Feed Me Books Friday! B has an unusual fascination with umbrellas – love your simple suggestion – he’ll adore the additon to his pretending!